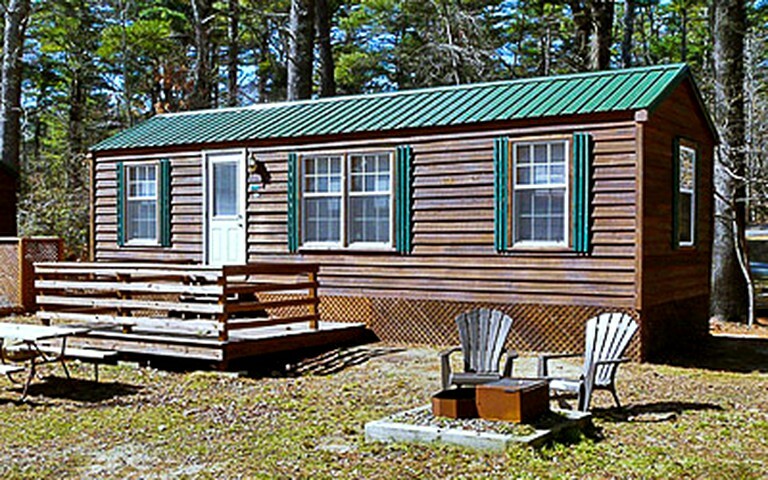 This dog-friendly cabin getaway is located amid luscious forest trees in Cape Cod, Massachusetts, and can accommodate up to seven guests. Guests will find a queen-size bed in the master bedroom. The second bedroom comes with three single bunk beds and one larger double bunk bed. 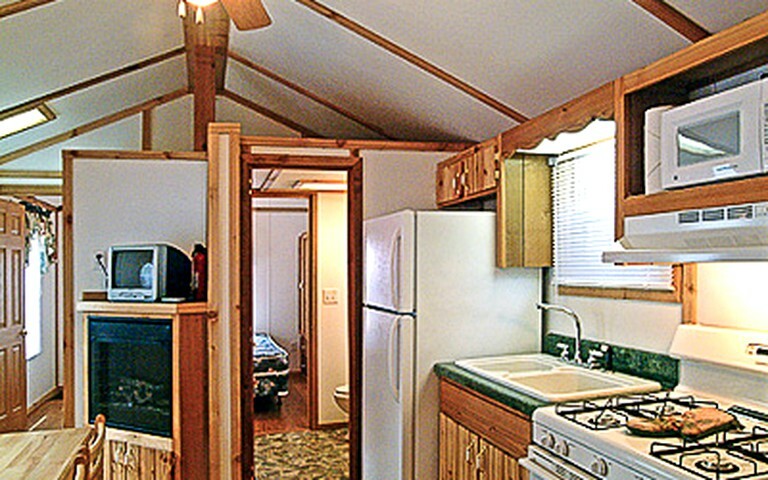 The full bathroom features a toilet, a sink, as well as a walk-in shower. Linen and towels are not provided. In the cozy dining and living area, guests will find a wooden dining table that seats up to six guests, as well as cable TV, a DVD player, and a ceiling fan. The fully-functional kitchen comes with all the necessary equipment guests may need, including a sink, a refrigerator, a stove, a microwave oven, a toaster, a coffeemaker, and basic cooking and cleaning utensils. Guests will be treated to a fantastic variety of modern-day conveniences at this once-in-a-lifetime accommodation. 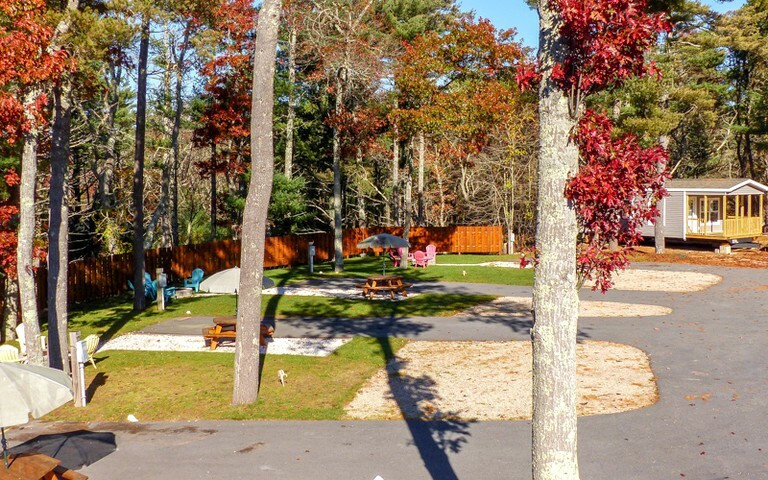 Glampers are encouraged to make use of the private lake access and spend time frolicking in the water or resting back on the beach sand and enjoying the view. The accommodation also includes access to a sports field, three in-ground swimming pools, an adult fitness grail, a waterslide, as well as free limited Wi-Fi. 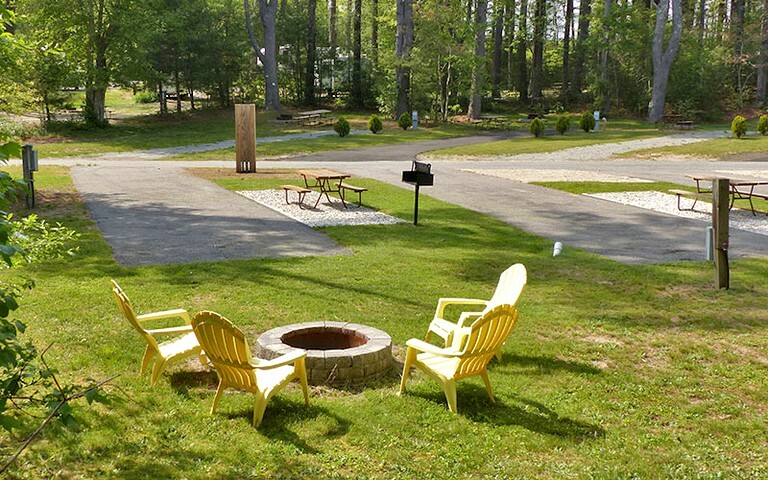 There is a wide range of adventures to be had within the accommodation grounds, as well as the nearby vicinity. Cape Cod is a well-known getaway destination with a number of delightful villages, seafood shacks, lighthouses, ponds, as well as bay and ocean beaches to check out. 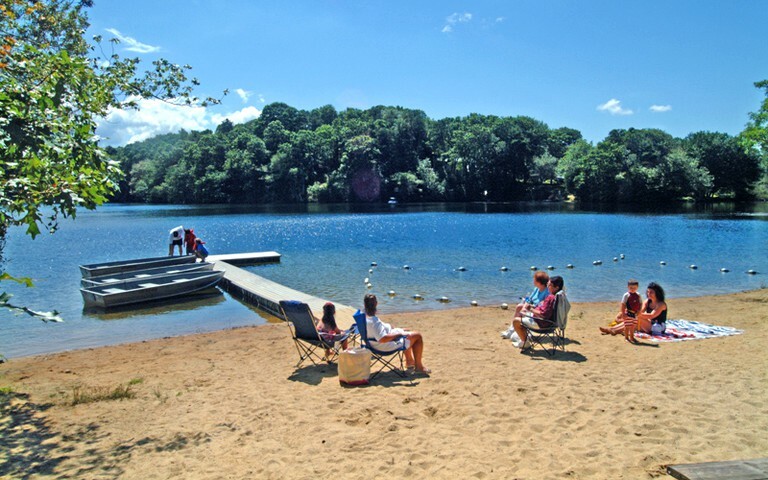 On the property, guests will have access to a private lake with a sandy beach that is perfect for swimming or tanning on, a number of fishing and boating opportunities, paddle boat, and rowboat rentals, a large waterslide, as well as an adult fitness trail. With a plethora of artists and galleries spanning the peninsula, Cape Cod is truly a great destination for guests with an artistic flair. Places like Flying Pig Pottery, which sells one-of-a-kind functional stoneware, Lucy J Glass, who specializes in fused glass, stained glass, and jewelry, or ArtsFalmouth, where they celebrate local artisans and performers with The Arts Alive Festival in late June. One of the main reasons Cape Cod attracts so many tourists on an annual basis is that of the wide variety of boating opportunities available on the surrounding waters. Monomoy Island Excursions is one of the many companies that offer a unique experience in Cape Cod, Here, guests will be welcomed aboard a high-speed catamaran for a narrated seal cruise around the beautiful island of Monomoy. Pets are welcome, however, guests should inquire with the hosts regarding the pet fee. Pets must be registered at the office with proof of applicable shots and ownership on file. Children may not be left in the park unattended at any time.